Allow me to open with what many believe to be an incredible confession. 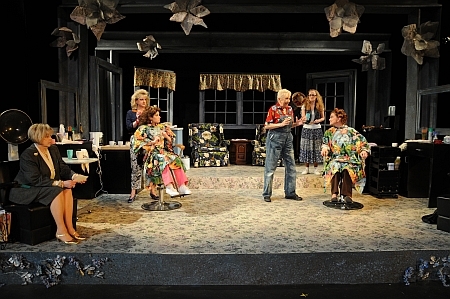 Until last weekend in the very capable hands of the Texas Repertory Theatre’s talented actresses, I had never before seen a production of “Steel Magnolias” on the stage or screen. Of course I had seen occasional clips from the popular film, but somehow managed to never see it in its entirety. That goal is now at the top of my “to do” list. Better still, I hope I can get my hands on a copy of the original play’s script so I can linger a bit over the endlessly hilarious dialogue that has so many laugh lines that one misses some while laughing out loud at the prior ones. But there are serious themes here as well, and perhaps it is the humor that helps us through the glimpses of heartbreak. In any event, this brilliant Robert Harling play has found its match in an equally brilliant Texas Rep cast that is superbly directed by Craig A. Miller. From the outset, the cheerful costume designs of Sonia Lerner, and the scenic design of Liz Freese, present us with the delightful Louisiana beauty parlor of down-home hairstylist, Truvy (Jamie Higgs). The gay magnolia blossoms that decorate the proscenium, and the floral design that dances across the floor, both serve to enrich the atmosphere of a cozy shop that we men could only imagine. What a friendly place for the abundant girl-talk that follows, and author Harling’s delicious wit seasons most every scene during the giddy and delightful interplay among the gals. Miss Higgs gives us a darling Truvy we love on sight, as she mixes the wit with her special brand of wisdom. She is breaking in a shy new stylist named Annelle (Dallas Milholland). If Miss Milholland’s timidity seems a bit overdone at first, don’t despair. Her characterization becomes more complex and interesting as the plot develops, and she rightfully earns her place in this stellar cast. In a wonderfully animated performance, Kathy Davis beautifully portrays the role of Clairee, a well-to-do widow who frequents the shop. Amanda Bird gives a stunning and wide-ranging performance as the bride-to-be, Shelby, who is in the shop getting spruced up for her wedding. Miss Bird has a radiant and infectious enthusiasm that absolutely lights up the stage. Shelby beams with the excitement of her approaching marriage, and the ensuing gabfest with her friends in the beauty parlor is simply great fun to witness. What is quite remarkable is the skill with which Miss Bird takes us to another acting dimension when Shelby’s health concerns bring us into a much more serious sphere. Complementing her performance is that of Helen Myers who does a superb job as Shelby’s concerned mother, M’lynn, a stylish career woman who is a bit secretive about the clients to whom she provides guidance counseling. At once elegant and compelling in her portrayal, Myers’ thoughtful characterization is beautifully crafted and helps to anchor the production. The same is true for Elaine Edstrom’s cranky but loveable characterization of elderly Ouiser, an outspoken country gal who has no shortage of money or sharp-tongued remarks. Steel Magnolias continues with final performances this Friday and Saturday, April 10th & 11th 2009, at 8p.m. Texas Repertory Theatre is located just 1/8 mile north of FM 1960, in the Northwoods Lighting shopping center at 14243 Stuebner Airline Rd., Houston Texas. For tickets and information call 281-583-7573, or visit the website at www.texreptheatre.org. But you better hurry. The word of mouth on this increasingly popular theatre and this outstanding production is selling out the house.